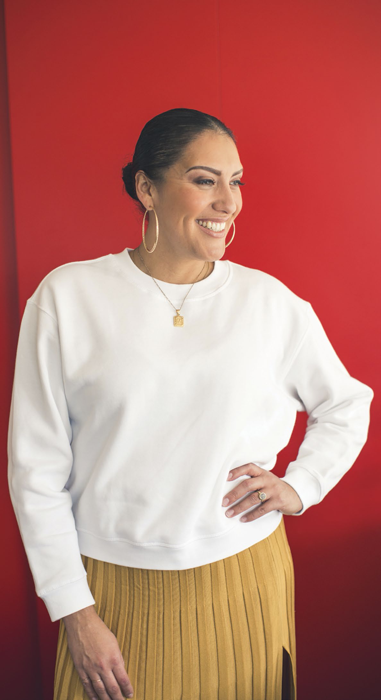 MARITZA DAVIS, vice president of experiences and social responsibility for the Sacramento Kings and co-founder of Unseen Heroes with her husband, Roshaun Davis, reveals how art and order are part of her unique style. How does your personal style get expressed at home? My style is more minimalist and modern, so that’s really how my house is, too. I love art and design. People think it’s strange because I don’t have family photos up. Instead, Roshaun and I collect a lot of art, mostly from friends and artists who live in Sacramento. There’s a lot of color and life in our house. It’s exciting to walk in and see all these different pieces that mean something to me. What could a person learn about you from walking into your home? They would definitely learn that I am ultra-over-the-top organized. I like everything clean and in its place. As a mom of three boys, how do you keep your space family friendly? We live in a three-story loft in Oak Park that is perfect for our family. A lot of our furniture is covered in family-friendly fabrics that are easy to clean, things that are more washable. That’s just where we are in life. I like to invest in good pieces that are washable versus fancy items. Do you and Roshaun ever disagree on aesthetics at home? We do disagree aesthetically at times. For example, he would put collages of things on the wall and I would want just one big piece, something really simple. I personally like all-white bedding for the kids and he always wants to add more color. So we’ll compromise by adding a couple of pillows or adding more art pieces in the rooms. But our style is pretty similar for the most part. He has a really good eye for putting things together. What’s the one object in your home that’s totally unnecessary but you couldn’t live without? I’m obsessed with my Nespresso machine. It has this piece that froths your milk. It seems so frivolous, but I can’t live without it.